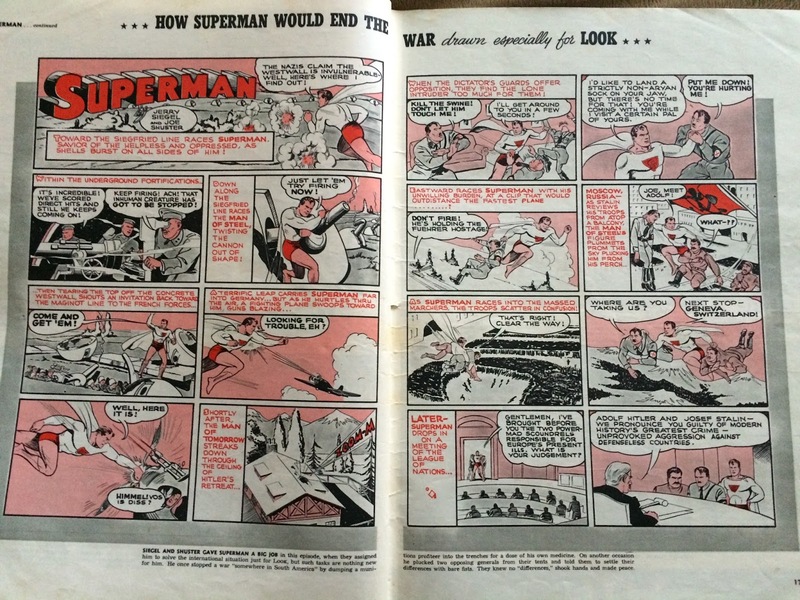 Look Magazine, February, 1940: "How Superman Would End the War"
In 1940, more than a year before the United States officially entered World War II, Jerry Siegel and Joe Shuster created a two-page Superman story for Look Magazine, titled "How Superman Would End the War". I had seen reproductions of the story a few times before, and it always fascinated me with how bold it was for the time it was published. I never thought I'd get a chance to even see the original magazine, let alone own a copy, but a few weeks ago, I somehow managed to purchase the issue in question from February 27, 1940. The issue is oversized by today's standards, probably one and a half times larger than modern magazines. The copy I got is in pretty good shape, minus some stress to the spine. The colors on the cover are still bright and stark, in line with the photo coloring done in that time. 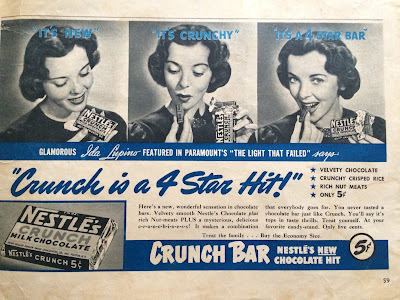 The cover features Hollywood star Rita Hayworth shaking...maracas? Well, okay. 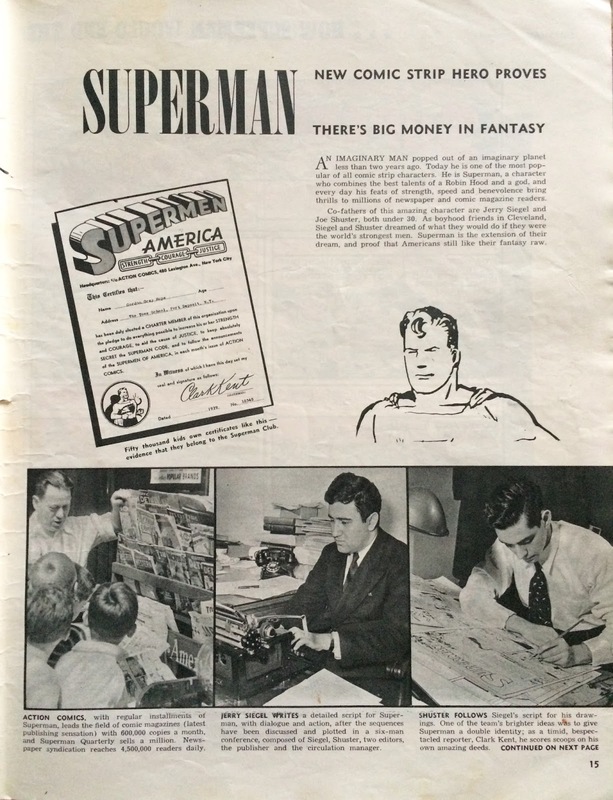 In the top left, under the logo, Superman gets a blurb. The "What it Means to be Neutral" article featured so prominently on the cover is a bunch of claptrap about why the US should leave Europe to its own devices and how the First World War didn't accomplish anything good, and I guess is a product of its time. 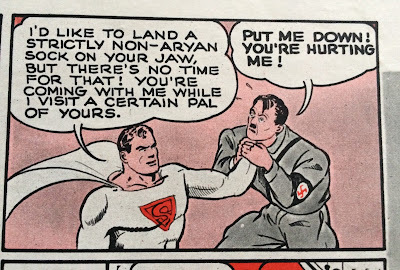 The inclusion of a Superman comic that takes much the opposite stance makes it stand out all the more in a magazine that is mostly filled with puff pieces and large photo spreads. Incredibly, the page before the comic has a short feature on both Jerry Siegel and Joe Shuster, something I'm sure National Comics (later DC Comics) would be disinclined to do. The features names Superman as a "new" character, which makes my head swim to think that it was ever the case. This was published fewer than two years after Superman showed up in Action Comics #1, so he was absolutely a new at this point. 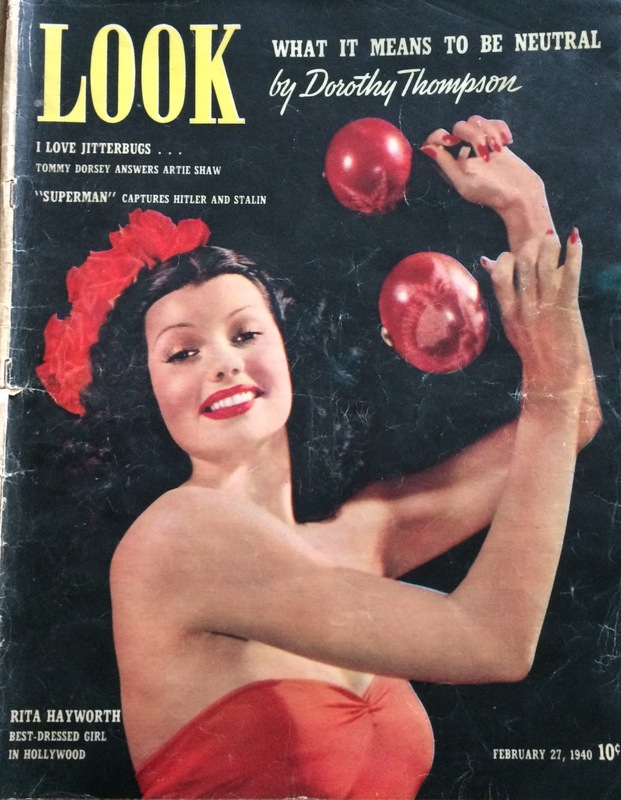 To put it in perspective, Batman was first published 11 months earlier in Detective Comics #27, Captain Marvel first showed up the very same month as this edition of Look Magazine, and Wonder Woman was still more than a year and a half away from existing. The comic itself is only two pages long, but Siegel and Shuster, both Jews who were undoubtedly keenly aware of the atrocities happening across the Atlantic, pack it full of action, and it resonates emotionally, despite the odd juxtaposition of a fictional character with real-life despots. Most of the magazine's interiors are black and white, but adding just one other shade to this story (an extra publishing expense) loans some depth to the story. Its placement almost makes the story seems as if it's published in full color. Take a second to think about how incredible this page is - and how something similar would probably never be published today. 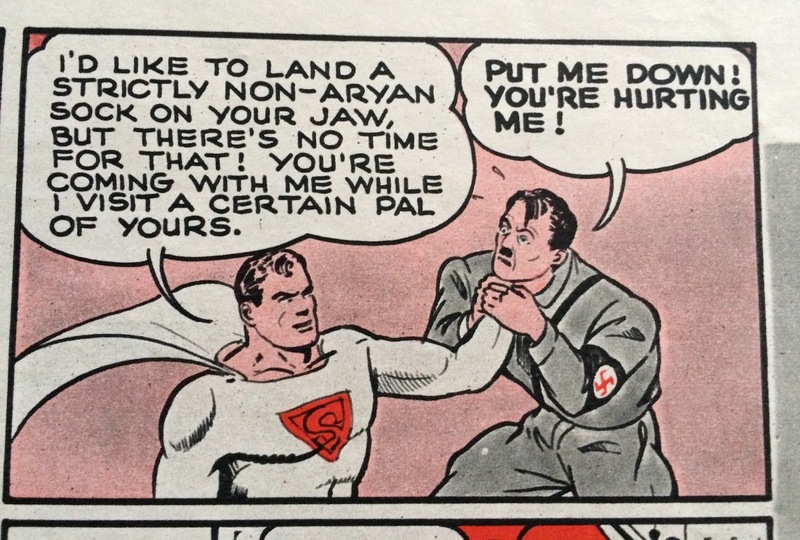 Superman crashes into Hitler's secret headquarters, and then swoops into Moscow to grab Stalin as well, lugging them both to the League (League?) of Nations in Switzerland. While much of America was still debating on whether or not to involve themselves in the war, Jews often were the most vocal about the need to intervene. The Three Stooges, for example, lampooned Hitler months before the bombing of Pearl Harbor. I often wish that today's comics - specifically Marvel and DC - would take a more pronounced stand on social issues like they had in the past. That's not to say that there aren't still brave creators working for those large companies, but their corporate ownership has, naturally, watered down these voices in an attempt to remain as marketable as possible to broad audiences. But comics have a great history of standing up for those in trouble, and they can have a stronger impact than some may think. The above panel is just incredible! I took a few other pictures of the magazine's interiors, but I don't want to take away from the comic itself in this post. Well, okay, I'll post an ad from (I think) the inside back cover. 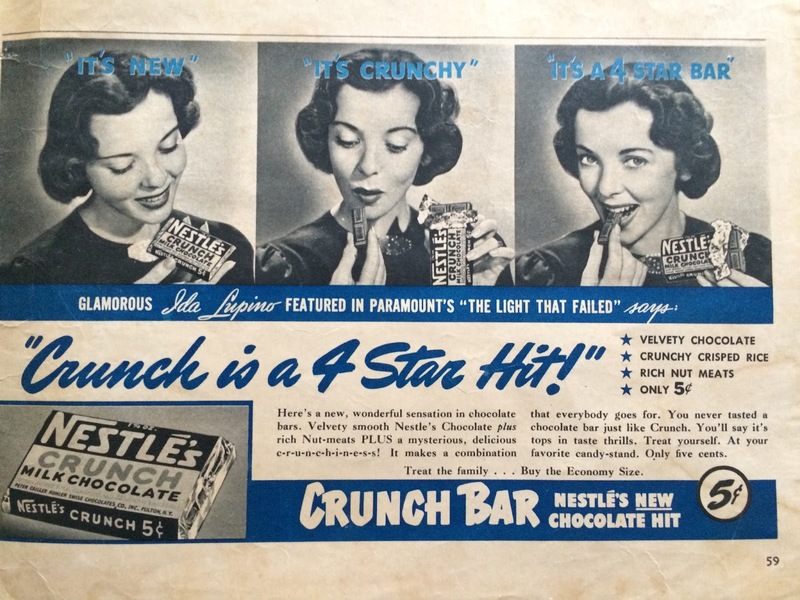 Is this the first ad for a Nestle's Crunch Bar?? And it's only a nickel!! Lookit that. The time has come...to look at the rest of the pictures I took at the 2017 New York Comic Con! All of these pictures are from Saturday, October 7th, the second of my two days at the show. After leaving Penn Station, I was greeted by these obviously (obviously) Futurama-inspired signs. The first event on the docket for Saturday was Amazon's Tick panel, which filled up fast. I managed to squeeze my way into, I guess, the third row. We all got a look at the upcoming episodes, which appear on February 23rd! They also handed out even more free swag in the form of posters upon entering. It's great how the entire cast has shown up at these big events - they all really seem to care about the series. After the panel ended, I left the convention hall for a bit, and on the way out, I saw a few costumes, including this one, whatever it was. Video game characters, maybe?? The medieval Spawn character is, interesting story, not actually owned by Todd McFarlane. Another interesting story: after taking the picture, I found out that the person in the costume is the same gentleman who dresses up as Silent Bob every year at Comic-Con in San Diego. Neat! While outside, I visited the recently completed High Line Park, which was a really incredible experience. The High Line is a park built on an old elevated train line. It runs for about a mile and a half and is 30 feet above street level, which makes for a stark departure from the rest of Manhattan. I just happened to be walking under it on my way back to the convention center and decided to climb the stairs to see what it looked like. It was crowded but was absolutely worth visiting. It's a must-see on my NYC list from now on. Walking from one reality to another, I was greeted upon returning to the Javits Center with the image of someone dressed up...as the Javits Center. Not bad. Even HawkPeople have to take a break sometime. I visited the DangerBoat a few times while at NYCC. I had to get all of the Tick pins. Here's a nice shot of the outside of DangerBoat. This is probably the best costume I saw at the show. Look at how yellow this guy got his arms! These were pretty good, too. New England Comics had a small booth on the show floor, and I signed some copies of the new Tick #1 there on Friday and Saturday, and a number of Tick luminaries stopped by at different points. Here's writer and producer David Fury, one of the main driving forces behind the new Amazon show. Fury also had a role in "Dr. Horrible's Sing-Along Blog", which I talked with him about just a bit. Check out these costumes! These guys put a lot of work into them. That Captain America shield is really great, too! After the main floor closed, I spent a little bit of time in Artist Alley until the show ended. The Javits Center is under some construction, and will be for a few years, as I understand it, so all of the featured artists were stuffed into a smaller-than-you'd-expect conference-type room as opposed to the usual separate hall. I'd hope that next year they could get a better location, but you never know with NYCC. In the meantime, check out what Geoff Darrow drew all over his table! And despite what the picture might indicate, I was happy to chat with Rafer Roberts for a little while before the show ended. NYCC 2017 was a lot of fun, and the weather held up long enough for me to spend some time outside, which was a departure from previous years. I hope they continue to find ways to branch out and relieve some of the crush that seems inevitable with a convention this size. It's a nice way to end the convention year for me! Has there been a better costume to come out of Marvel in the last 25 years? 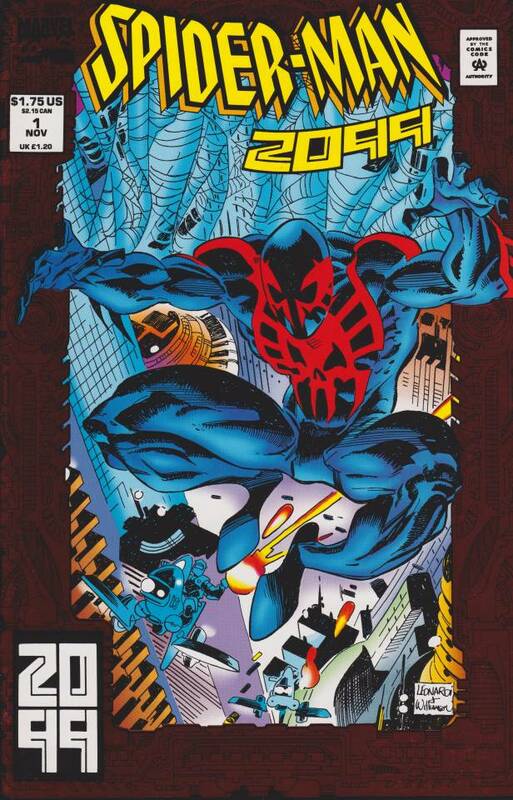 Anyway, ever since I picked up a few issues of the 2099 books in the early '90s, I've held a soft spot for them. I tend to try and focus my original art purchases on the Fantastic Four and books I've personally worked on, but these few have managed to sneak their way in. Let's take a look! This first piece is from Spider-Man 2099 #27, and even though he's out of costume, this page features Miguel O'Hara, Spidey himself. The art is by Joe St. Pierre, and it was gifted to me by one Ian Nichols. 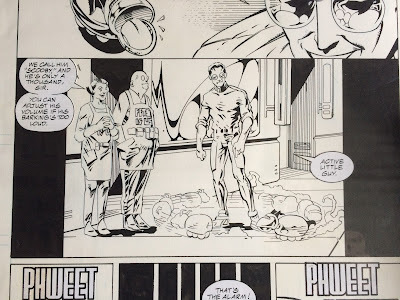 I worked with Joe on a short story for Rhode Island's AR Comics, and even though he was doing me a favor by letting me write something for the book, Ian sent me this page as a thank you. They - they said the word "Alchemax"! It wouldn't be a proper 2099 title without it. 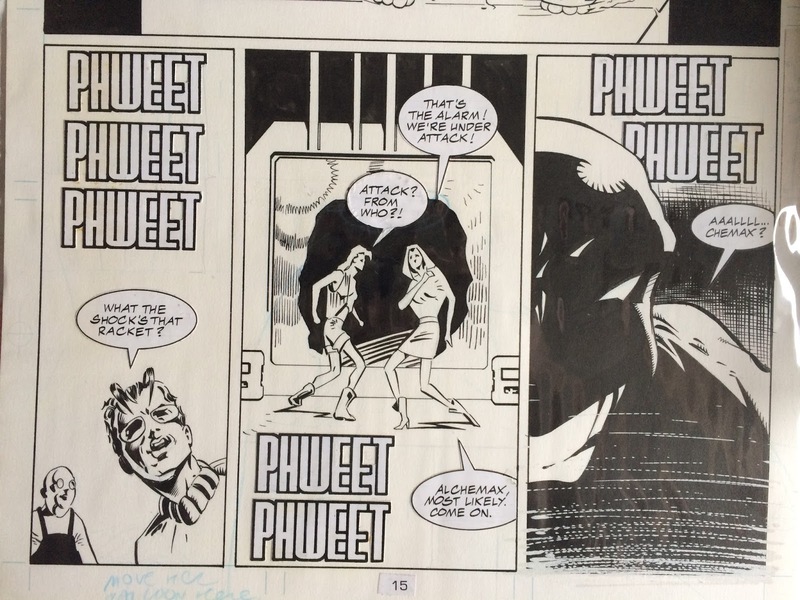 This next page is from the second issue of Ravage 2099, the 2099 line's only non-derivative title of the launch! 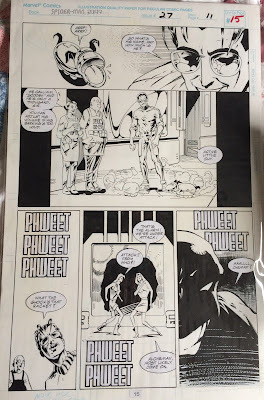 This is the second page of original art I own from the late, great Paul Ryan, one of my favorite artists of all time. Oh, and it was also written by none other than Stan Lee! That's pretty exciting. 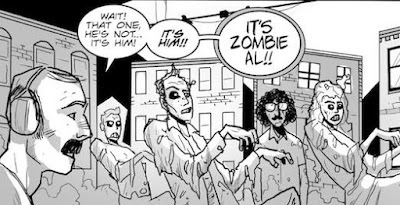 One fun note about this page is that the word "blasterproof" was added in the second-to-last panel as a late edit. I guess "bulletproof" didn't sound futuristic enough! Oh, Ravage 2099. You were weird. These next two pieces are a bit more modern, coming from the recent relaunch of the Spider-Man 2099 series. Both are pieces of preliminary art, and both are by Pasqual Ferry. 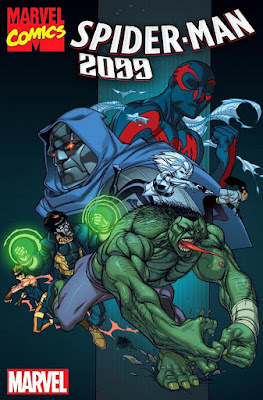 The first one is rough pencils that eventually became the a variant cover to Spider-Man 2099 #4, with a number of 2099 characters, like Spider-Man, Hulk and Doom! Here's the final version. It changed a good bit from concept to print. 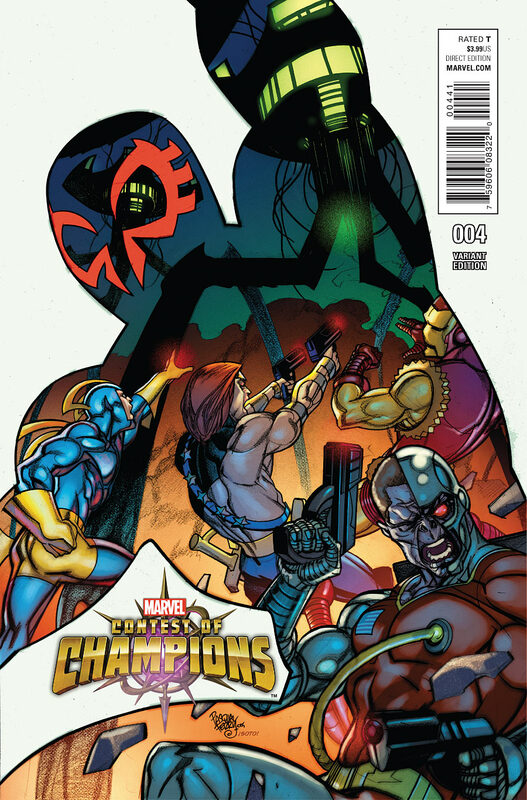 The next rough sketch eventually became a variant cover to Contest of Champions #4, which featured a number of Marvel's characters from the future, including Iron Man 2020, who has two years left to remain a part of this group. Here's the final cover, which took a lot from the rough sketch on the left. I do like the Killraven/War of the Worlds inspired Martian ship in the image to the right! But I'll take Spider-Man 2099 original art any way I can get it. 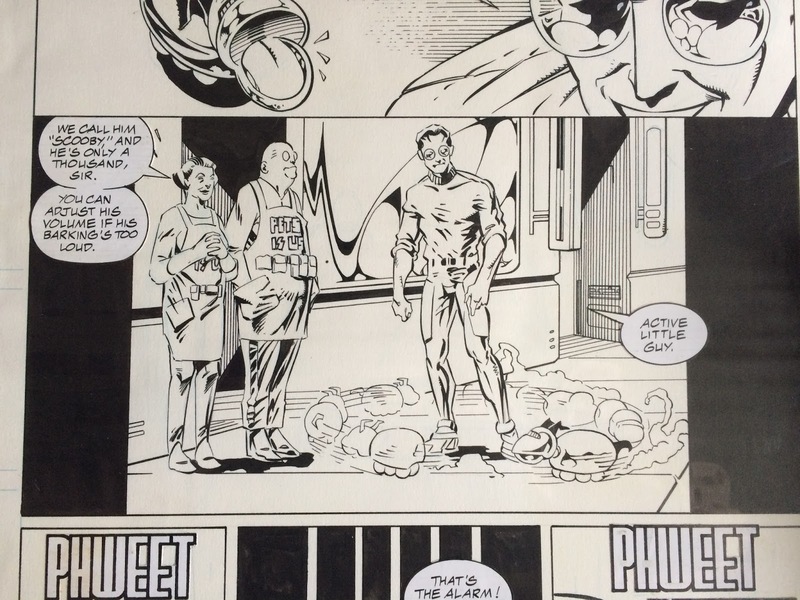 The Tick's tour de force continued in October of 2017. After the first six episodes landed on Amazon's streaming service in August, the team prepared for the next batch to arrive in February by setting up at the New York Comic Con, just a few miles away from where the series films most of its scenes. After being dumbfounded at how incredible the Tick setup was at Comic-Con in San Diego, I wondered if there would be any promotion at the next big show in New York. Short answer: there was. It's hard to compare NYCC to San Diego's Comic-Con, in large part because of the space available for the two shows. SDCC sprawls out over the city, while NYCC is mostly confined to the Javits Center in Manhattan (though there were a few offsite locations and events this year, notably at the New York Public Library). The weather contributes to this; San Diego has sunny July days ripe for outdoor events, while it's tough to judge what the weather will be like in New York in October. At any rate, The Tick had a large presence on the main show floor with one of the bigger displays of the show. Once again, Amazon stepped up with their promotion of this show. Near the row-100 area of the floor were banners and signage, an area for a lineup and...a full-size "Dangerboat" replica. Naturally, this is the first thing I did upon entering the building on Friday, my first day at the show. The line took about 45 minutes to get through, and as I was approaching the front, I started to notice some of the people just ahead, behind the exhibit ropes. I lucked out quite a bit as I was getting in just as a number of actors and producers were arriving to get a peek at the exhibit. I managed to get a picture with Scott Speiser, "Overkill" on the show, and Barry Josephson, one of the show's executive producers! Josephson asked if I was a fan of the show. I said "yes". Dangerboat itself looked a but unassuming on the outside (maybe that's the point), but the inside was just incredible! Here are a couple shots of the inside, which included a lot of interactive screens. You could get an ID sticker printed, steer the boat, and grab a can of Fo-Ham. The Dangerboat AI could also be found on board! It followed you around and talked to you at various points. It tried to poke fun at my Steelers hat, but as we all know, that's a futile pursuit. They're going to win their seventh Super Bowl in a few weeks, just FYI. The Overkill uniform could be found as well! I wonder where you buy carpet that simulates ocean water. Naturally, I grabbed a bunch of the free Tick swag on my way out, which was precipitated by the arrival of talk show host Wendy Williams (who was in full Wonder Woman gear). I then hit the convention floor, where there were a lot of great costumes to be seen, including Pickle Rick. I wonder what makes you decide to put a television screen on your head. Kudos to this guy in any case, and great job with the group Saga costumes. Here's one I didn't expect to see - it's Captain Telsa from the Image Comics Descender series! I've always enjoyed the Robotman (from Doom Patrol) design. Hey, Cliff. Oh, and Telsa makes a second, background appearance. I wonder how Psylocke got her sword through the entrance? And Dr. Doom got his blaster through as well. I guess Doom gets what he wants. Check out this kid in an honest-to-goodness Sewer Urchin costume from the Tick animated series! I think I've seen this guy as Bloodshot before, but hey, if it works, go with it. Great job. Here's Black Panther with blurry motion action! Yondu and Mary Poppins was a popular choice this year. This gentleman retrofitted what looks like a snowboard with wheels to make a pretty neat Silver Surfer costume! I'm pretty sure BoJack and Princess Caroline were actually taking a moment and not posing as their characters, but they inadvertently relaxed in the most BoJack poses ever. Rick's gon' give it to ya. Well, the hammer placement is a bit unfortunate, but that's still a pretty great Steel costume (Power Girl is good as well). DC had their regular setup spot at the far end of the convention hall. This time they put their Justice League costumes on display. On the way out for the night, I ran into DC's Scott Snyder, who was gracious enough to take a picture with me. Snyder is writing the (pretty enjoyable) DC book, "Metal", and he managed to stay on brand for this picture. Pretty savvy, guy. That's it for Friday pictures! More to come!